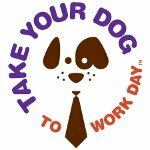 Take Your Dog to Work Day is an annual event typically held on a Friday following Father's Day (the third Sunday in June). It was created by Pet Sitters International (PSI), the largest educational for professional pet sitters in the world. PSI launched Take Your Dog to Work Day (TYDTWD) in 1999 in the United States. On June 24, 1999, an estimated 300 companies encouraged their employees to take their dogs to work and introduce them to their dogless coworkers. PSI believes that witnessing the human-animal bond will encourage dogless coworkers to adopt a dog from a shelter or rescue group. In 2000, TYDTWD was acquired by Pets.com, a doc-tom enterprise that specialized in selling pet supplies. However, the business closed that same year, and PSI regained the trademark and continued to coordinate and promote the day. The 2001 celebration saw the introduction of the “poster dog” theme. Over the years, TYDTWD has become popular outside the United States. It sees increasing participation in Canada, the UK, Australia and New Zealand. Each year, PSI offers a free Action Pack that can be downloaded from its official website. The pack contains event forms, planning tips and other information for companies interested in holding a TYDTWD event. Registration is not required, any company is free to participate without informing PSI beforehand.